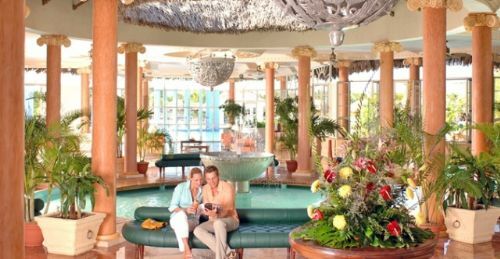 Iberostar Varadero opened in late 2004 and the three storey buildings are scattered through beautiful landscaped gardens in a peaceful location some 20 minutes from the centre of Varadero. The hotel Iberostar Varadero benefits from 3 magnificent swimming pools plus a children’s pool and is situated on a spectacular stretch of beach towards the end of the peninsula. 3 à la carte restaurants (Mediterranean, Japanese and Cuban specialties) and 1 beach restaurant. Full board at buffet restaurant. Continental breakfast for late risers from 10 am to 12 noon. Evening meal à la carte with reservation. Palapa Grill for lunch (12 – 4 pm) and snacks (4 – 6 pm). Local and selection of international drinks and snacks around the clock (alcoholic drinks available from 9 am to 2 am). Sun loungers, parasols and towels free of charge by the pool and on the beach. Spa with fitness room, Jacuzzi, sauna, aerobics, billiards, table tennis, tennis, volleyball. Pedaloes, kayaks, cycling tours and – subject to availability – catamaran sailing, windsurfing and snorkeling equipment free of charge. Varied entertainment during the day. Shows and live music in the evenings. Dance classes. Try one of the best Varadero Cuba Hotels Now. No reviews for Hotel Iberostar Varadero yet.